The aim of this case report is to describe an uncommon etiology of back pain caused by purely epidural spinal cavernous hemangioma, to review the literature and to highlight the diagnostic challenges associated with this lesion. The differential diagnosis of extra-axial soft tissue lesions of the spine has been briefly reviewed, including comparison of the imaging features of this lesion with other more common pathologies at this site. A 61-year-old female patient presented with diffuse pain in the dorsal region of the back of 3 months duration. There was no history of fall or trauma. There was no history of radicular pain in the chest. There were no associated sphincter disturbances. The tone, power and reflexes were normal in all four limbs. On local examination, there was no focal tenderness over the spine. A plain and contrast-enhanced magnetic resonance imaging (MRI) study of the dorsal spine was performed. The MRI showed an extramedullary, extradural space occupative lesion on the right side of the spinal canal from D5 to D7 vertebral levels. The mass was well marginated and there was no bone involvement. The lesion was hypointense on T1-weighted images [Figure 1] and hyperintense on T2-weighted images, in comparison to the intervertebral disk. On post-contrast, fat suppressed, T1-weighted axial [[Figure 2]a] and sagittal [[Figure 2]b] images, the lesion displayed intense and homogenous enhancement. Compression of the adjacent thecal sac was observed, with displacement to the left side. Radiological differential diagnosis included nerve sheath tumor and meningioma. The patient underwent D6 hemilaminectomy under general anesthesia. Intraoperatively, the tumor was purely extradural in location with mild extension into the right foramina. No attachment to the nerves or dura was found. The mass was mostly soft and reddish with more bleeding noted than usual for a meningioma or a schwannoma. Total excision of the extradural compressing mass was possible as there were preserved planes all around. Back pain disappeared after total surgical excision. 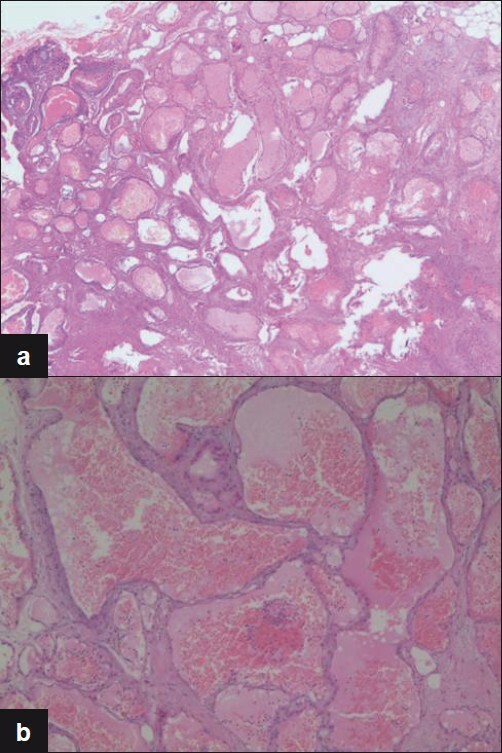 Histopathology revealed cavernous hemangioma [Figure 3]. On histology, the lesion was composed of multiple, closely spaced, dilated and ectatic vascular channels containing blood. The spaces were lined by a single layer of benign endothelial cells. Nuclear pleomorphism and mitotic figures were not seen. The patient followed up for 15 months after surgery and she had complete resolution of symptoms. Follow-up MRI at 15 months showed no residual or recurrent lesion [Figure 4]. The differential diagnosis of extra-axial soft tissue lesions of the spine has been briefly reviewed, including comparison of the imaging features of this lesion with other more common pathologies at this site. As illustrated in our case, purely epidural hemangiomas, although uncommon, ought to be considered in the differential diagnosis of spinal epidural soft tissue masses. Findings that may help to differentiate this lesion from the ubiquitous disk prolapse, more common meningiomas and nerve sheath tumors are its ovoid shape, uniform T2 hyperintense signal and lack of anatomic connection with the neighboring intervertebral disk or the exiting nerve root. In our case, differential diagnosis offered, based on preoperative MRI features, was nerve sheath tumor and meningioma. The presence of intense, homogenous post-contrast enhancement and lack of anatomic connection with the disk ruled out a prolapsed intervertebral disk. Retrospectively, we realized, the shape of the lesion was unusual for a nerve sheath tumor. The mass did not have the linear or dumbbell shaped configuration characteristic of a nerve sheath tumor; it appeared instead to enclose or wrap around the adjacent thecal sac. The high T2 signal was unusual for a meningioma. Other than meningiomas and nerve sheath tumors, less common differential diagnoses for this lesion would have included metastasis, round cell tumor, sarcoidosis, histiocytosis and tuberculosis. The absence of any bony changes at all in our case made metastasis, round cell tumor and eosinophilic granuloma unlikely. Epidural lymphoma shows characteristic low T2 signal. Although spinal epidural granulomatous pathologies such as tuberculosis and sarcoidosis with no origin in the vertebral body are known entities, they are uncommon. Leptomeningeal sarcoidosis and tuberculosis are likely to be more linear in morphology with craniocaudal extension along more than one vertebral body. They are also associated with other systemic signs and symptoms as well as with mediastinal lymphadenopathy in most instances. Clinical presentation of these lesions may be with local symptoms such as back pain or with radiculopathy and/or myelopathy. Commonly, these lesions present as lumbar radiculopathy that clinically and radiologically mimics the presence of disk herniation. In our case, the patient did not complain of radiculopathy or myelopathy. The clinical course is usually slowly progressive. Acute clinical deterioration may be observed in a few instances - related to significant growth of lesion, intralesional hemorrhage or thrombotic venous occlusion. The propensity to bleed is explained by the thin-walled vessels and by stasis of blood flow in the lesion. Other causes of acute symptoms include estrogen mediated neoangiogenesis in the lesion or drainer compression by a gravid uterus. Of the approximately 84 cases of this entity reported in literature, four cases were seen in the pediatric population; ,, rest of the patients were adults. The clinical presentation of back pain, radiculopathy and myelopathy usually leads to an MRI examination in these patients. A digital subtraction angiography (DSA) has no role in diagnosis as these lesions have no communication with the spinal arterial circulation and are angiographically occult. Purely extradural benign vascular lesions of the spine are rare and comprise less than 6% of all spinal neoplasms. They include cavernous hemangioma, arteriovenous hemangioma and also angiolipoma. Cavernous hemangiomas are commonly encountered as solitary or multiple intracranial lesions. Spinal cavernous hemangiomas most often originate from the vertebral bodies, sometimes with secondary extension into the extradural space. Entirely extradural lesions with no bone involvement represent about 12% of all intraspinal hemangiomas. ,, To the knowledge of the authors, about 82 cases of purely epidural spinal hemangiomas, without primary origin in the vertebral body, have been reported in literature to date. As in our case, a review of literature shows that the diagnosis is almost always missed on preoperative imaging. Therefore, although the lesion is rare and a high index of suspicion is required for the diagnosis based on pre operative imaging, cavernous hemangioma should be included in the differential diagnosis of purely extradural soft tissue lesions of the spine. It has been suggested  that early and accurate diagnosis followed by complete excision of the lesion prior to any possible episodes of massive intralesional bleeding is related to a favorable outcome. Sudden intralesional hemorrhage can lead to spinal cord compression and subsequent severe disability. 1. Rovira A, Rovira A, Capellades J, Zauner M, Bella R, Rovira M. Lumbar extradural hemangiomas: report of three cases. AJNR Am J Neuroradiol 1999;20:27-31. 2. Shen W,Chou G,Chen C, Lee S. Magentic resonance imaging of spinal extradural cavernous hemangioma. Acta Neurol Sing 1994;3:223-6. 3. Feider HK, Yuille DL. An epidural cavernous hemangioma of the spine. AJNR Am J Neuroradiol 1991;12:243-4. 4. Graziani N, Bouillot P, Figarella-Branger D, Dufour H, Peragut JC, Grisoli F. Cavernous angiomas and arteriovenous malformations of the spinal epidural space: report of 11 cases. Neurosurgery 1994;35:856-64. 5. Padolecchia R, Acerbi G, Puglioli M, Collavoli PL, Ravelli V, Caciagli P. Padolecchia R, Acerbi G, Puglioli M, Collavoli PL, Ravelli V, Caciagli P. Spine (Phila Pa 1976) 1998;23:1136-40. 6. Jo BJ, Lee SH, Chung SE, Paeng SS, Kim HS, Yoon SW, et al. Pure epidural cavernous hemangioma of the cervical spine that presented with an acute sensory deficit caused by hemorrhage. Yonsei Med J 2006;47:877-80. 7. 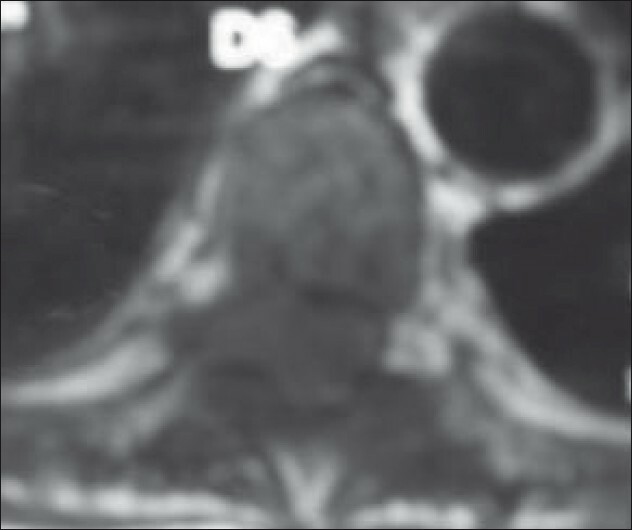 Aoyagi N, Kojima K, Kasai H. Review of spinal epidural cavernous hemangioma. Neurol Med Chir (Tokyo) 2003;43:471-6. 8. Carlier R, Engerand S, Lamer S, Vallee C, Bussel B, Polivka M. Foraminal epidural extra osseous cavernous hemangioma of the cervical spine: a case report. Spine (Phila Pa 1976) 2000;25:629-31. 9. Clatterbuck RE, Cohen B, Gailloud P, Murphy K, Rigamonti D. Vertebral hemangiomas associated with familial cerebral cavernous malformation: segmental disease expression. Case report. J Neurosurg 2002;97:227-30. 10. Fontaine S, Melanson D, Cosgrove R, Bertrand G. Cavernous hemangiomas of the spinal cord: MR imaging. Radiology 1988;166:839-41. 11. Hurt M. Les hemangioblastomes intrarachidiennes. Neurochirurgie 1975;21:1-136. 12. Padovani R, Poppi M, Pozzati E, Tognetti F, Querzola C. Spinal epidural hemangiomas. Spine (Phila Pa 1976) 1981;6:336-40. 13. Jellinger K. Vascular malformations of the central nervous system: a morphological overview. Neurosurg Rev 1986;9:177-216. 14. Minh NH. Cervicothoracic spinal epidural cavernous hemangioma: case report and review of the literature. Surg Neurol 2005;64:83-5. 15. Zevgaridis D, Büttner A, Weis S, Hamburger C, Reulen HJ. Spinal epidural cavernous hemangiomas. Report of three cases and review of the literature. J Neurosurg 1998;88:903-8. 16. Sarikaya-Seiwert S, Gierga K, Wessalowski R, Steiger HJ, Hänggi D. Solitary spinal epidural cavernous angiomas in children presenting with acute neurological symptoms caused by hemorrhage. J Neurosurg Pediatr 2010;5:89-93. 17. Jellinger K. Pathology of spinal vascular malformations and vascular tumors. In: Pia HW, Djindjian R, editors. Spinal Angiomas: Advance in Diagnosis and Therapy. New York: Springer; 1978. p. 9-20. 18. Guthkelch AN. Hemangiomas involving the spinal epidural space. J Neurol Neurosurg Psychiatry 1948;11:199-210. 19. Padovani R, Tognetti F, Proietti D, Pozzati D, Servadei F. Extrathecal cavernous hemangioma. Surg Neurol 1982;18:463-5. 20. Richardson RR, Cerullo LJ. Spinal epidural cavernous hemangioma. Surg Neurol 1979;12:266-8. 21. 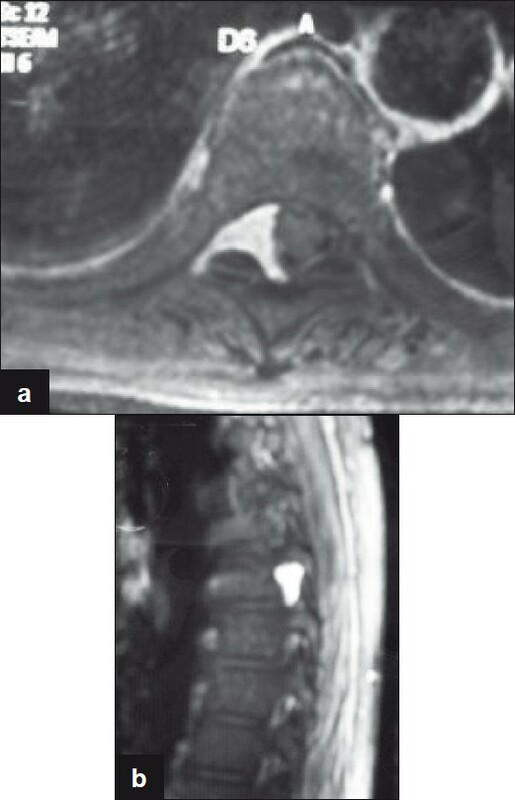 Aoyagi N, Kojima K, Kasai H. Review of spinal epidural cavernous hemangioma. Neurol Med Chir (Tokyo) 2003;43:471-6. 2 A pure epidural spinal cavernous hemangioma - With an innocuous face but a perilous behaviour!! Hemalatha, A.L. and Ravikumar, T. and Chamarthy, N.P. and Puri, K.